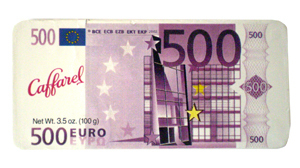 I'd be lying if I said I didn't miss the Lire, but this 33% light milk chocolate Caffarel bar fashioned after 500 Euro reassures me that at least some things will never change, like my affinity for the sublime taste of Italian chocolate. I picked it up at Dean & Deluca for only $6 bucks. If only the current exchange rate was as propitious. ooh, I'll have to look for this one, there is a Caffarel nearby!